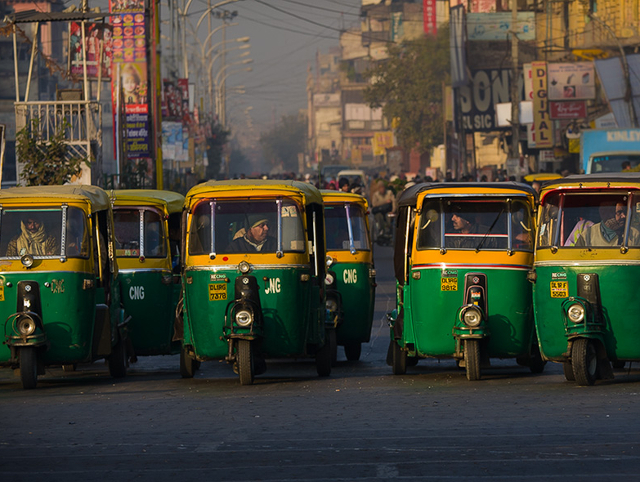 Auto-rickshaw drivers wait at a stop light. Metershare, a ride sharing app, helps commuters in Mumbai to coordinate shared auto-rickshaw rides. Photo by Phil Marion. Carpooling is not a new idea. In order to save money, reduce congestion, or simply use a High Occupancy Vehicle (HOV) lane, friends and neighbors have been sharing rides for a long time. For a country like India, which is expected to become the most populous country in the world by 2025, and for which the number of cars on the road grows every year, solutions like car sharing can’t come too soon. As smartphone penetration increases across India, the solution to gridlocked traffic may lie in apps and other new technologies. Metershare, a new app developed by students in Mumbai, India, takes ridesharing to the next level, encouraging strangers going the same direction to meet up in order to share a taxi or an auto-rickshaw. By encouraging users to share something other than a personal car, the app offers a solution to Mumbai’s congested streets. Efforts in alternatives to car ownership have taken hold around the world in developed and developing countries alike. Companies like Car2Go or Zipcar offer the chance to drive cars shared with strangers, but not to share rides. In Beijing, the government has tried to reduce the number of cars on the road by simply assigning its citizens different days on which they are allowed to drive. In Washington DC, in response to HOV lanes, strangers carpool by “slugging”—riders line up at an appointed slugging stop, and drivers who need that extra passenger drive by and pick them up. Think of it as controlled hitchhiking for commuters. Uber, an app which connects its users with independent, user-rated “drivers” makes similar attempts at connecting drivers with riders. Uber operates in cities around the world, but this app focuses more on “riding in style” than saving money and fuel. Consequently, Uber operates in cities where you would expect to find citizens with disposable income and an interest in having the appearance of a “private driver”—Munich, Singapore, and San Francisco among others. Metershare, which is currently in beta testing in Mumbai, uses similar technology, performing much of the same functions as Uber, but to a very different end. This ridesharing app is geared towards the developing world. Its creators, Rishabh Jhunjhunwala, Nisarg Shah, and Nilesh Dungarwal, designed the free app after experiencing their own frustrations as students dealing with the cost of transportation and India’s congested roads. The app enables users to create and share rides with fellow passengers traveling on the same route. After meeting up, the passengers share a cab or rickshaw ride, and the fare. In order to facilitate this, the app relies on a host of new technologies, including Facebook (for user identification), Google maps (to identify routes), and Google “auto-complete” (to ensure that users are identifying their location using standard terms). After inputting “to” and “from” locations on the map, the app presents users with all existing available rides on the same route. A user can join one of these rides, or create his own. Nilesh Dungarwal, founder of Metershare, says “the app’s purpose is, in part, to connect riders in order to reduce the amount of traffic on Mumbai’s congested streets.” In addition to offering cheaper fares, the app has particular features which may account for its successful debut in Mumbai: female riders may specify that they only want to rideshare with other women, and users can choose whether they want to take a taxi or an auto-rickshaw. Apps like Metershare have only been possible within the past few years, as smartphones penetrated the market in India. Mobile phone penetration in India is about 26% right now, according to some estimates, and that includes phones which wouldn’t have the capability to run an “app.” But smartphone use is on the rise. Anticipating, or perhaps spurring this, Google announced that it is going to open one of its flagship “Android Nation” stores in New Delhi later this year. Google has already opened one of these stores in Jakarta, Indonesia, and plans to open more of these stores in India, which are geared specifically towards allowing individuals in developing countries to try the android phones prior to purchase. India had an estimated 70.6 million 3G subscribers in 2012—that’s a 3G penetration of just 6%. While it is likely that smartphone users are concentrated in cities, and that the percentage of smartphone users is much higher than 6% for cities like Mumbai, smartphone solutions to problems with traffic and pollution will likely be dependent on how quickly smartphones spread. Tags: Asia, India, mass transport, Mumbai, Muriel MacDonald, public transportation, ride-sharing, shared-taxi, Washington, D.C.